Do you spend a large majority of your waking hours looking for parking, talking about parking, worrying about parking -or one of my best friend’s all-time favorites -telling really great stories about parking? Well then maybe it’s time to lose your car! Owning a car in downtown Boston can be time consuming and expensive. It can be wonderfully liberating to live without a car. Reason Number One: No More Parking Tickets! How happy would it make you to never have to pay a parking ticket again? Oh the things you might do, the places you might go –you’ve got extra spending money! You know what I’m talking about. Did you read that sign correctly? Or did you read the wrong sign altogether? Did a city ordinance have all the signs changed in the middle of the night? Imagine not having to care one way or the other. You’re bundled by the fire after a day on the slopes, far from the city, only to realize your car is parked on a major artery back in Boston, and a snow emergency requires it to be removed. Imagine not having to worry about where your car is, ever. Reason Number Four: No More Registration, No More Insurance, No More Parking Stickers. So, are you thinking the car-less life doesn’t sound too bad after all and want to learn more? Well then read my list of . . .
Way Number One: You Can Walk Places. Cardio is good for you and Grrrreat for the environment too! Walking is liberating and fun. You will see things you’ve never noticed before. You can work on your waistline. You experience Zen moments with the morning birds and squirrels before you get to the office. And that’s all great for your health –but it doesn’t stop with just your well-being alone, it’s great for the planet, too. Way Number Two: Tired of Walking? 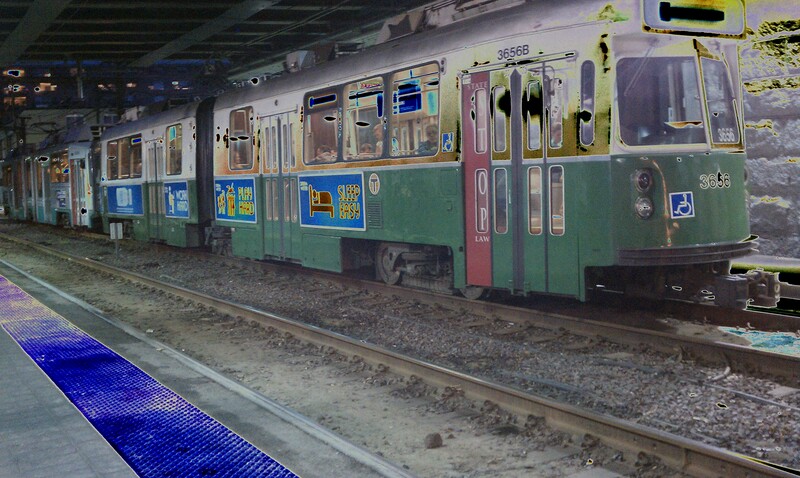 Ride the T! You Can Meet New People. You have at least one full stop to get them to like you and they are a conveniently captive audience. You Can Read That Book you started twenty times, but don’t have time to read at home. You Can Check Out the Art! (See picture to right. 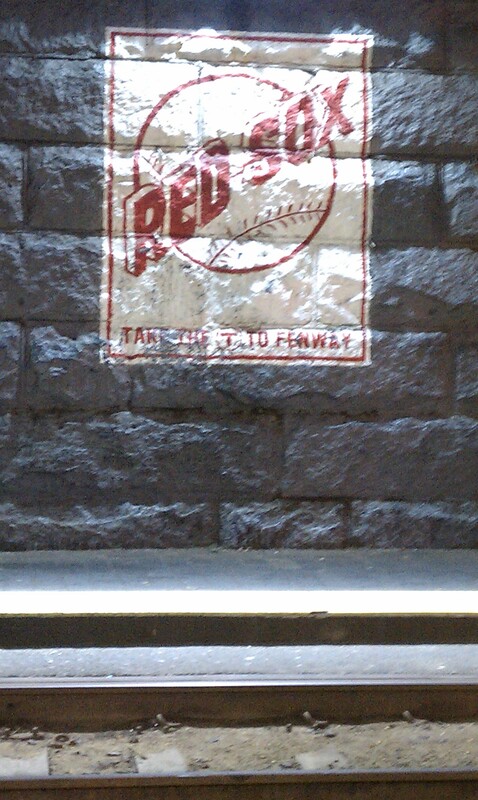 That’s a wall painting at the Fenway T stop). Way Number 3: Maybe the T’s not for you? Ride a Bike. Don’t have your own bike? Don’t despair. The Hub’s got a wicked new bike sharing program. Check it out here: www.hubway.com. PS: Don’t forget your helmet -it’s a matter of safety as well as a fashion statement. Now get on your bikes and ride! Way Number Four: I Really Need a Car. OK then, Just Zip It! If you really just can’t live without the wheels, maybe you can at least live with –sharing the wheels! Zipcar is a fantastic company that exists solely to get you from place to place in a car. Just sign up for a membership then jump in a car wherever they’re parked. It’s that simple and cars are available all over town. See how simple life can be?